My friends in the US are always fascinated by the Turkish coffee, how it is made without any filters and it’s perceived strength. They ask me how one prepares one. So here it is. Foamier the better. To make a cup of good Turkish coffee, you first need an authentic Turkish coffee pot with an elegant waistline, and usually made from copper, aluminum, or steel. This is a delicate instrument and also a delicate process, so yes, an elegant waistline is required. Then you need the perfectly ground Turkish coffee. As it may not be easy to find Turkish coffee in your area, go to your local coffee store or supermarket and ask them if their coffee grinder has a setting for Turkish coffee. Any strong coffee bean ground using Turkish coffee setting will be a good substitute. You will also need the beautiful, ceramic Turkish coffee cups. You can use espresso cups as a substitute. Take one, fill it almost completely with water but still just below the rim. This will be the measurement of water you will need per cup or per person. If you’re making it for yourself and your guest, measure two cups of water using your espresso cup into the coffee pot. Then, add the sugar to your liking. 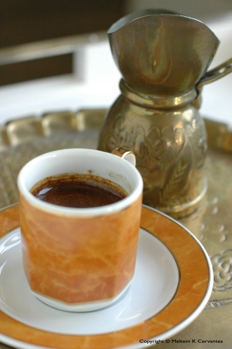 Ask your guests, how they would like their Turkish coffee; sweet, black or medium (orta). This determines how much sugar will be needed. If you want it sweet, one full teaspoon of sugar per cup of serving will be enough. Then, measure and add one teaspoon of ground Turkish coffee per cup or per person. Make sure to add all these ingredients before you even turn on the stove. As you probably also noticed, there are no filters required for this recipe. It is true that for Turkish coffee, the coffee grounds are boiled in the pot and are not filtered out. Mix your ingredients in the pot, so coffee blends slowly into the water. Once the heat is on - use low heat-, watch your coffee. It will slowly start to create a foam on top. Just before it boils and you lose the foam, but just after the foam thickens on top, remove the pot from the heat. If it boils, it will be too late and you will lose your foam. Pour away just the top foamy layer into two espresso cups evenly. This is really the most important step in preparing a Turkish coffee as foam is your reputation. No foam, no glory for a good cup of coffee! After serving the foam, return the coffee pot with the remaining liquid (with no foam) back quickly to the stove for another boil in low heat. When it is just about to boil again, you can remove it from the heat and distribute the remainder of the coffee into the cups. By then, it may have created another layer of foam if you’re lucky. If you have done everything correctly, each cup will have a nice pillow of foam on top. If you haven’t, we will just be polite and drink your coffee anyway. Practice makes perfect. Are you now wondering about reading the fortunes of your guests in the coffee cups? Well, that is all together another art form and another article. Are you a believer? For Turkish fortune telling, you need a foamy cup of Turkish coffee served in small coffee cups and an intuitive but creative coffee reader.